On Ethiopian Food – she eats. While the picture you have is good, it doesn’t do justice to Ethiopian cuisine. Thai and Indian foods are ‘hot’ spicy. Ethiopian is not ‘hot’ spicy…it is more ‘aromatic’ spicy. I love all spicy food! Your friends/coworkers may like Persian/Mediterranean cuisine. Pingback: Blue Nile « she eats. Greetings. I see you did a post about Ethiopian food on your blog. Here on WordPress, I have an entire Ethiopian Food blog. 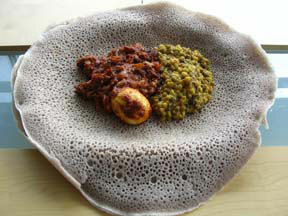 I thought you and your visitors might be interested in looking at it: ethiopianfood.wordpress.com.